Work is continuing this week on the installation of a second primary burner at the controversial municipal incinerator. Paul Oldford, solid waste manager for the Cape Breton Regional Municipality, said Tuesday the unit should be completely installed and operational well before the end of the month. “It’s under construction now. 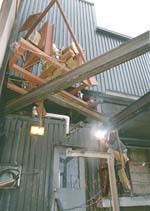 The steel work is in place and one of the burners has been mounted but not connected,” said Oldford. 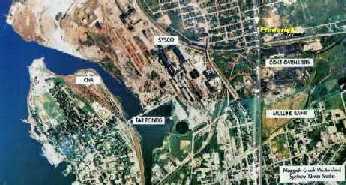 The new equipment was included in the recommendations offered by Department of Environment engineer, Arun Chatterjee, who inspected the Grand Lake Road facility after a complaint that biomedical waste was being completely destroy. Environmental activist Marlene Kane has submitted a videotape to the department showing large portions of undestroyed waste. The regional incinerator burns all the hospital waste in the province in addition to regular household and commercial waste. Chatterjee said Tuesday he feels the second burner should remove any doubt that the waste won’t be completely destroyed. Sydney - Residents of the Cape Breton Regional Municipality will see more blue bags at the curb, starting this fall. As part of a new $16.6-million municipal waste strategy, homeowners will be asked to separate their recyclables, like pop cans, from their organic waste. But even the municipality doesn't know what will happen if people don't comply. "We're going to phase in a program in the next few months," said Coun. Mike White, who serves as chairman of the committee that devised the plan. "What happens if they don't ... good question. At the present time, we're hoping the education component will work and people will comply." The Atlantic Coastal Action Program will launch the education campaign. Once the program is in place this fall, cardboard, fibreboard, food cans, newsprint, milk containers and beverage containers will be processed at a materials recovery centre at the Sydport Industrial Park. Although residents pay a deposit on beverages, the municipality will not refund it when blue bags are picked up at the curb. "People still have the option of going to the Enviro-Depots (to collect their refunds)," he said. Mr. White said council has no choice but to implement the program because of new provincial regulations. "We either do it or we simply get subjected to very heavy daily fines," he said. In the meantime, council is trying to convince the provincial Environment Department that incineration is just as good a method of getting rid of garbage. "Let's just say we're having a meeting of minds ... to try to get them to recognize that incineration, which takes waste and converts it to energy, is a viable alternative," Mr. White said.